In my previous article I demonstrated using Wicket's AbstractAjaxBehavior to integrate with the jQuery UI Autocomplete component. In this article I build upon those concepts to create a reusable JQueryAutocompleteTextField. If you haven't read my previous article please do so now. Also, this article assumes you know how to add libraries (jars, libraries, projects) to a project using Netbeans. Wicket provides numerous reusable components and behaviors that makes page composition simple. Any custom components that we develop should be just as easy to use and be as reusable across projects as well. These factors serve as motivation for encapsulating all the logic I presented in the previous article into a fully self contained reusable component hosted in its own jar file which can be reused in any project just like any one of Wicket's standard components. 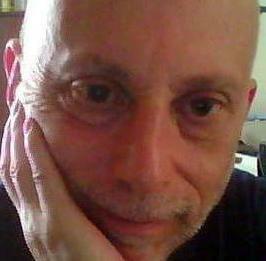 I will be using Netbeans v7.0.1 throughout this article. If you aren't using Netbeans along with the Wicket Plugin for your Wicket development then you aren't using the best IDE available for Wicket development period. This powerful duo provides a level of support for Wicket development that no other IDE can offer. I highly recommend that if you haven't done so already to please download and install Netbeans and then install the Wicket Plugin. You won't regret it, I promise you. JQueryAutocompleteTextField should be just as simple to create as it is to create an out-of-the-box TextField. It also has to be as generic as an out-of-the-box TextField. In the case of JQueryAutocompleteTextField we will extend Wicket's TextField and add our own generic implementation onto that. JQueryAutocompleteTextField has to be reusable across projects so that means it has to be hosted in its own jar file. With our requirements and objectives now having been stated, lets move onto the project structure we will need in order to create a reusable Wicket component library. As I previously stated above in Objectives And Requirements, item #3, the JQueryAutocompleteTextField needs to be hosted in its own jar file. Our goal here is to provide a reusable library. Users of this library will have to include it in their classpath in order to compile their own code and they will also need to have the Wicket jar files on their classpath so that the library can resolve its dependencies on Wicket as well. Fire up Netbeans and from the main menu select File | New Project | Java | Java Application and click Next. Enter any name you want for the Project Name. I am using WicketJQueryIntegration. If the Use Dedicated Folder for Storing Libraries option is selected, unselect it. Also unselect Create Main Class if it is selected and then click Finish for Netbeans to generate the project. Right click on the default src package and select Refactor | Rename and enter any package name you wish to use. I am using com.wicket.jquery.integration.autocomplete. The next thing to do is to add Wicket 1.5 to our project. If you don't already have Wicket you can go to http://wicket.apache.org/ and download it. I am using version 1.5.3. WicketJQueryIntegration also requires google-gson which you can download if you don't already have it. Add it to the project as well. With our dependencies added to the project and accounted for we need to do one more thing and that is to insure that the libraries we require for compilation aren't packaged in the jar - it is the responsibility of the users of JQueryAutocompleteTextField to provide the dependencies on these in their classpath. If we don't do this, then we are building in a level of dependency on the exact same versions of these libraries and we don't want to do that. Right click on the project node and select Properties and select Packaging. Uncheck the Copy Dependent Libraries option and click OK.
We will begin implementation by creating a subclass of AbstractAjaxBehavior. In my previous article we used an implementation of AbstractAjaxBehavior that was tightly coupled to providing support for selecting states. However, because our goal is to create a reusable implementation, one that isn't tightly coupled to any particular use case, our implementation must therefore provide flexibility, allowing the user to implement their own requirements. 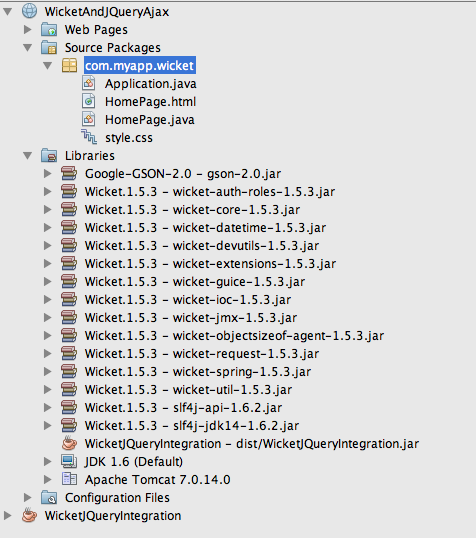 Create a Java class in the com.wicket.jquery.integration.autocomplete package. I named mine AbstractJQueryAutocompleAjaxBehavior. In the editor mark the class as abstract and extend the class from AbstractAjaxBehavior. * behavior for the html element represented by the selector. In the code above we create a HashMap and add the jQuery selector and callback url to it, the names of which as you can see match those we used in our markers. Additionally, we obtain a PackageTextTemplate resource for the autocomplete.js file which resides in the same package as this class and then we call its asString method passing it the HashMap. asString will interpolate our resource using the HashMap we provided and return the interpolated content of the resource as a String. That solves our slight dilemma quite nicely I think and with very little code. Because we declared this method as abstract it will have to be implemented by the user of AbstractJQueryAutocompleAjaxBehavior which I will get to shortly but this is one way we keep this generic, by deferring implementation of this method. We also keep this generic by defining this method's return value using generics and in our case as a List of some object. * Convert List to json object. In the code above we provide numerous constructors allowing the user versatility in how they construct the component. Additionally, each constructor calls the method common which adds an instance of AbstractJQueryAutocompleAjaxBehavior to it. Because in AbstractJQueryAutocompleAjaxBehavior we declared getMatches as abstract we are here forced to provide for its actual implementation. All our implementation does is call JQueryAutocompleteTextField's getMatches method which is also declared as abstract. By defining this abstract method in JQueryAutocompleteTextField our users will have to provide their own implementation which will depend upon their individual use-cases and fulfills our requirement that this component provide a generic implementation allowing it be used however the user's use-case might dictate. That wraps up our implementation of JQueryAutocompleteTextField but a few things remain to be done. First we need to build the jar file so that we can use JQueryAutocompleteTextField in our Wicket applications and secondly we need to test it. We will cover both beginning with building the jar file. To build the components jar file right click the project node and select Clean And Build. Netbeans will compile the project and package the component in its own jar file. Notice how none of the libraries we are using to build the component are in the jar file - this is because when we created the project we instructed Netbeans not to include them. Users of the component will now be able to use what ever versions of these dependencies they see fit to use. Now all that remains is for us to test our component to make sure that it actually works so lets do that now by creating a small Wicket test application using Netbeans. Make sure you have already installed the Wicket Plugin. From Netbeans main menu select File | New Project | Java Web | Web Application which will open the New Project wizard. In the wizard enter any name you like for the test project. I named mine WicketAndJQueryAjax and make sure that the Set As Main Project option is selected. Click Next. Select either GlassFish Server or Apache Tomcat for the server option and click Next. From the list of available Frameworks select Wicket and then click Finish. 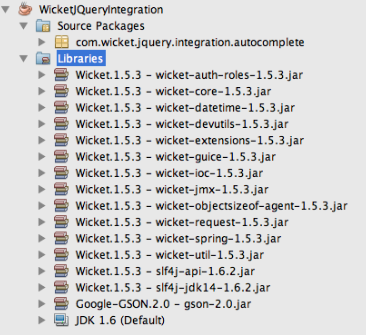 Netbeans will generate a complete Wicket project including the Wicket jars that the Wicket Plugin contributes. Because our component is dependent upon Wicket v1.5 we will have to replace the ones provided by the Wicket Plugin with the 1.5 versions. So remove all the contributed Wicket jars and replace them with those from the 1.5 distribution. Also, add the google-gson jar file to the project as well. Right click on the test project node and select Properties. From the Categories pane select Libraries and click the Add Project button. In the Add Project window select our components project, WicketJQueryIntegration and click the Add Project Jar Files button. Right click on the test project node and select Properties and select Libraries from the Categories pane in the Project Properties window. Select the option Build Required Projects and click the OK button. Now, whenever we build out test project, Netbeans will check to see if our components project needs to be rebuilt and will do so first before building our test project. 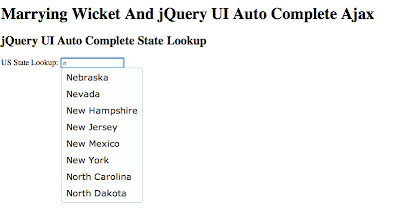 Our test project will mimic what my previous article did which was to implement an Autocomplete component that allowed the user to select from a list of states that match their input. Open the HomePage.html file in the editor by double clicking on it. When you do, both it and the HomePage.java file will open. This behavior, one of many, is contributed by the Wicket Plugin. Notice that in the above there is no reference to a jQuery UI Autocomplete component, just the normal markup one would expect in any Wicket application. Also notice, there is no jQuery ready handler either. The real magic takes place when the component is rendered by Wicket. * returning those in a list. Notice in the above that we add a JQueryAutoCompleteTextField to the form and that we also provide our own implementation for its getMatches method allowing us to tailor the component to our specific use case which is to find a list of states that match the value of term. Nice, hey? But wait, there's more. Select one of the suggestions from the list and it will propagate the text box. Once propagated, hit Enter to submit the form and now look at the server's log file and you will see log messages that your selection was submitted with the form. I have highlighted the points of interest in red that relate back to our component. As you can see, the jQuery ready handler itself was contributed and our component tailored it to use the selector we provided it. In addition, it also used the callback url. The success function receives the json object we responded with in our component's onRequest method which had called our getMatches method that we implemented in HomePage.java which returned a List of State objects. 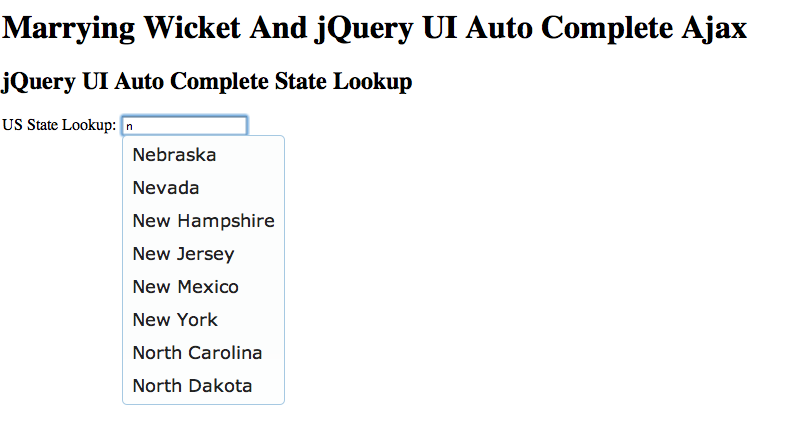 I hope you have enjoyed following along with me developing an awesome Wicket/jQuery Ui Autocomplete component. Feel free to leave your comments and please remember to come back soon as I am always cooking something new up to share with you. I tried to integrate your samples but faced some issues. 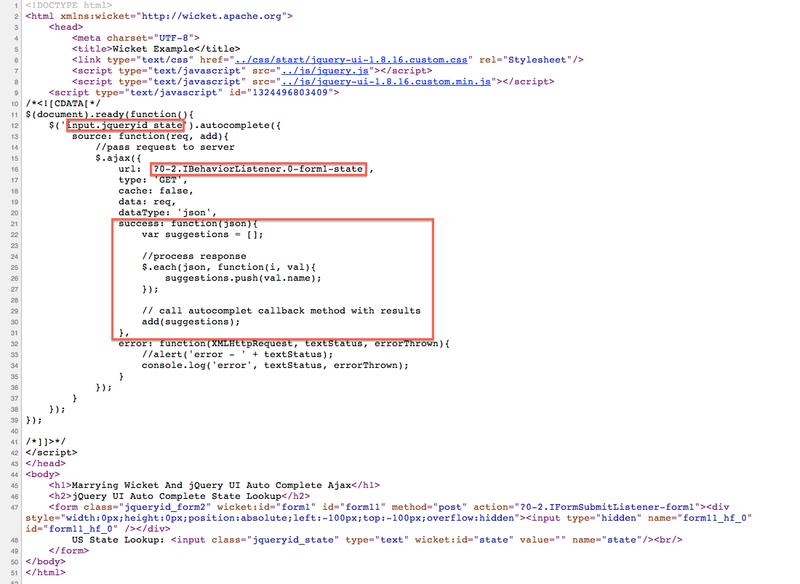 Basically, jquery is triggering the ajax request. But I do not see the suggestion list. I use wicket 1.5.4 and jquery 1.7.1 and ui 1.8.18. Do you see any errors in the Netbeans server log window and is the response being sent back to the client? Try using Netbean's HTTP Server Monitor to see what the status code is for the request which should be 200. If you don't see the HTTP Server Monitor window in Netbeans when you run the application then you have to turn it on by selecting Servers from Netbean's tools menu, select your server from the list and then configure the server you are using by checking on the Enable HTTP Monitor option. 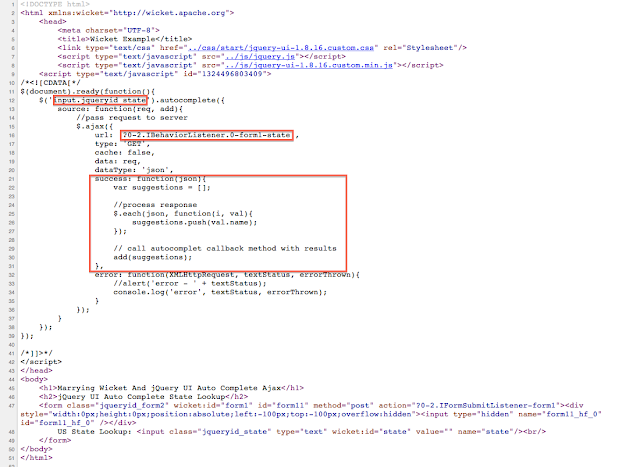 Also put a breakpoint on the client's jQuery Ajax success handler method and use the client side debugger's network monitor feature (in Chrome it iss Network and in Firefox it is just Net) to spy on the response http headers. Post back what you observer and we'll se if I can help. method onRequest need not necessarily be overridden. The article was based on Wicket v1.5.3. I updated the project to use Wicket v1.5.4 and tested it and everything works - I don't see any issues. onRequest is being called. I committed the changes to the repo so now the project required Wicket v.1.5.4. Perhaps your issue might be class path related but I cannot say for sure. I really appreciate your help. Now I am able to compile and use your code but the old problem still remains i.e, no suggestion list is shown. Additionally, I did debug with firebug (network). I see the JSON responses were sent back from the server, only that they are not shown or rendered. I created an svn repo for the demo application and modified the article to include the svn repo url at the top of this article. Thanks Jeff, its working now. I want to further make it Stateless. Tried to make behaviour statless by overriding getStatelessHint(Component c) to return true but did no help. Have you any idea how to make it stateless ? I know this is a little bit out scope ?